In Episode 31, we discuss the life and legacy of Emma “Grandma” Gatewood, who at 67 years old was the first woman to solo thru-hike the Appalachian Trail. Author Ben Montgomery gives us an intimate look at this extraordinary lady who overcame financial hardship, survived domestic and sexual abuse, and had 11 children and 23 grand children when she left a small town in Ohio to walk the A.T. in 1955. The book, Grandma Gatewood’s Walk is now a New York Times best seller, and Ben gives us a look at the life and legacy of Emma Gatewood through her photos and trail journals, from interviews with her surviving children, and by tracking down some of the folks that actually met and hiked with Emma on the Trail. Modern day thru-hikers walk with backpacks, tents, and sleeping bags – yet Emma had none of these items when she hiked the 2000+ mile Appalachian Trail three times in the 1950’s. She was one tough lady – and this is an inspiring tale of the suffering, strength, and triumph that brought much needed publicity and federal funding to the A.T. at a time when thru-hiking was in its infancy. You can stream this episode for FREE by clicking the bar below or follow this link to subscribe to the podcast (via iTunes, Google Play, Spotify, Stitcher, Blubrry (Android), Facebook, Google+, Twitter, RSS or email). We have posted our most recent episodes on these podcast networks and hope you enjoy them. I enjoyed your blog about Grandma Gatewood. When I was a Boy Scout in 1955 hiking the AT near Front Royal Virginia I shared a shelter with Grandma Gatewood. At that time the shelters had bunks with springs on top of them and she slept on the bare springs. She carried a feed sac with just a few things in it. One thing she carried was a small hand gun and she made it well known that she had it in her sac. We talked for a few hours before bed time and she told us (there were 4 Boy Scouts) she stopped at selected houses along the trail to have her meals. She had a sore ankle and walked with a limp. I really enjoy your pod cast but I wish you wouldn’t put too much emphasis on beer drinking. There are a whole lot of us who do not drink and enjoy nature at it’s best. I have been hiking for 45 years and have enjoyed being in nature with a lot of good people. Try my blog at http:/christianhiker@blogspot.com. I am just an occasional blogger not nearly as pro as you. Grandma Gatewood is a special lady and certainly an inspiration for many of the thru-hikers that followed. 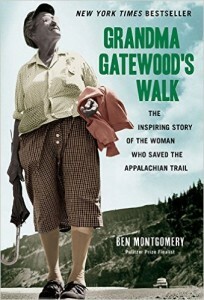 If you haven’t read Ben Montgomery’s book yet (Grandma Gatewood’s Walk) I highly recommend it. It sounds like she had numerous encounters with youth on the Trail and seems to have made a lasting impression on most of them. We have been known to kick back a few brews around the campfire, but the bulk of these shows are not recorded in the backcountry – so if you sample the entire series I think you’ll find that is not our focus. Thanks for the feedback and best wishes.